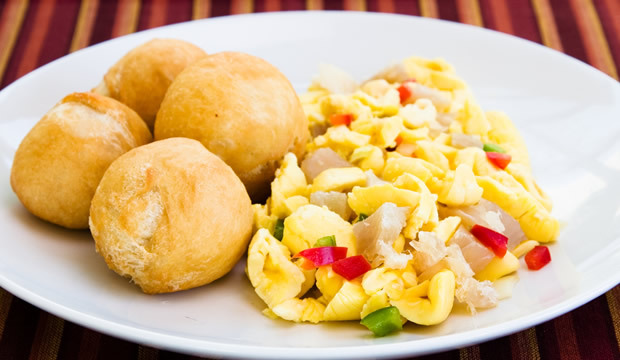 Jamaica's national dish is ackees and saltfish, a favourite in Jamaica and abroad. A bright red fruit that opens to reveal three large black seeds and a soft, creamy white flesh, ackees are often prepared like vegetables. When cooked, ackees are similar in texture and appearance to scrambled eggs, and they are a popular breakfast item - and a tantalizing delicacy. 1 teaspoon(s) scotch bonnet pepper, chopped. 1 teaspoon(s) Grace caribbean traditions black pepper. 1 can(s) Grace ackee in brine, drained. 1 tablespoon(s) Grace Vegetable Oil. ⇒Put saltfish to soak in cold water for about 1 hour. ⇒Pour off water; add fresh water and cook until tender. ⇒De-bone and flake salt fish. ⇒Heat Grace Vegetable Oil and saute onion; garlic; escallion; tomato; scotch bonnet pepper and sweet pepper. Add flaked saltfish; Grace Ackee and Grace Caribbean Traditions Black Pepper. ⇒Toss lightly; cover and allow to stand over low heat for about 2 minutes. 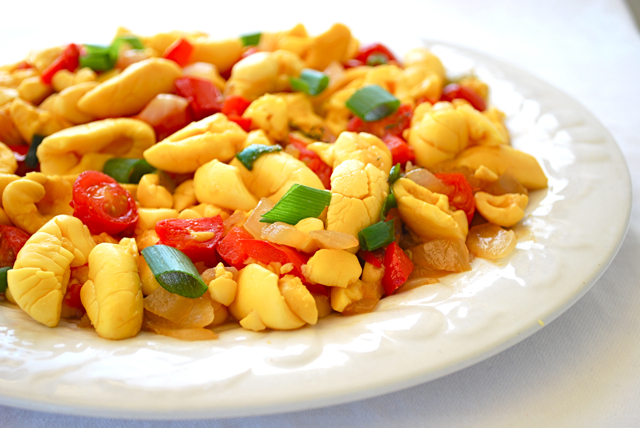 Jamaica’s national dish is ackees and saltfish, a favourite in Jamaica and abroad. A bright red fruit that opens to reveal three large black seeds and a soft, creamy white flesh, ackees are often prepared like vegetables. When cooked, ackees are similar in texture and appearance to scrambled eggs, and they are a popular breakfast item – and a tantalizing delicacy.